Live Love Planners: Week of 8/10: Weekly Decoration Post! Week of 8/10: Weekly Decoration Post! Since summer is ending, I think I speak for all of us when I say I am getting those end-of-summer blues. 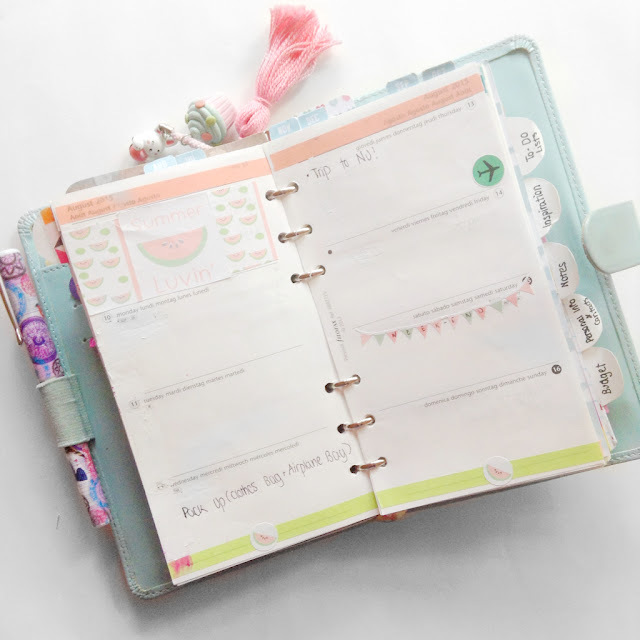 I love summer, being able to take a dip in the pool or sip on my non-alcoholic pina colada, and I love to reflect those vibes in my planner, so this week I thought I'd make the most of the rest of summer and make this week's theme watermelon! Isn't it juicy? (Sorry for the fruit pun, I just couldn't help myself haha!) So this week I decided to experiment a bit and I tried to use some Erin Condren vertical lay out stickers in my Filofax (yikes!) I tried to trim them down so I could put them in my header box, but let's just say it did not work out as I expected it to. So that's this week's set-up! Thanks for reading!